Located only 20 minutes from the Montego Bay Airport, the IBEROSTAR Rose Hall Suites is a 5-star, all-inclusive, luxury resort. This AAA- 4 Diamond hotel and winner of the 2013 Green Globe Award is perfect for couples and family vacations. 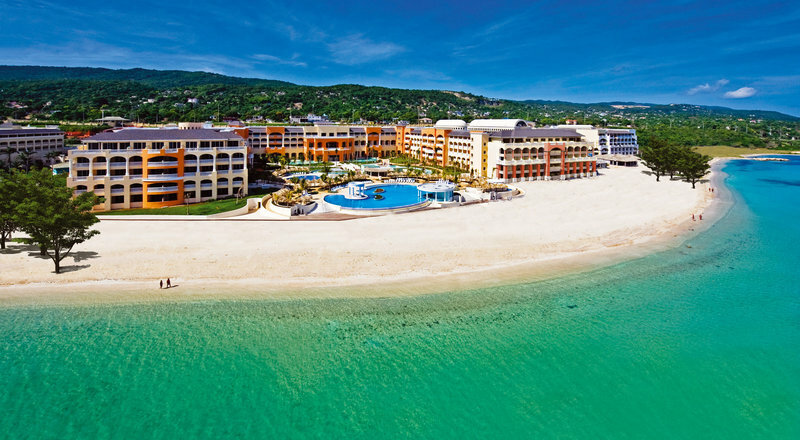 Hotel guests enjoy full exchange privileges with the IBEROSTAR Rose Hall Beach resort. The IBEROSTAR Rose Hall Suites is a part of IBEROSTAR’s Premium Gold Collection. It offers 319 suites of three different categories: Standard Junior Suites, Sea View Junior Suites, and Beachfront Junior Suites. Additionally, there are 2 Presidential Suites available as well. Each room has 24 hour room service, a stocked mini-bar, and a safe for valuables. WiFi is available in the rooms and hotel lobby. Many exceptional food options are available at this resort. 4 specialty restaurants, 1 buffet, 6 bars/ lounges, and a swim-up bar provide guests with fine cuisine and drinks. The restaurants serve traditional Jamaican food as well as international dishes including Mexican, Mediterranean, and American. Day and night entertainment is provided with a wide range of activities and programs. Guest can use the infinity pool, activity pool, slow river, and Jacuzzi. There is also a kid’s pool, water park, kid’s club, and playground to keep kids entertained. Adults can take a trip to the casino, play billiards, go to the disco, list and dance to live music, take dance lessons, and watch theater performances. Many sport options are available at the IBEROSTAR Rose Hall Suites resort. There is are tennis courts, a nearby golf course, and a fully equipped gym facility available for use. Guests can play basketball, beach volleyball, and soccer as well as participate in yoga and Pilates classed. Additionally, scuba diving and diving classes are offered. For those who would like to stay relaxed while on vacation a full service, 2 story spa is open for various treatments.